There’s a cool premise here, and a nice twist at the end, but the longer this movie goes on, the more tired of it we get. 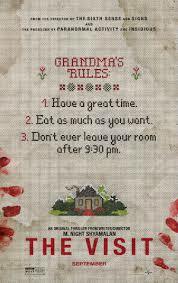 The Visit is a movie based on a cool premise, with a hell of a twist, that just doesn’t do a very good job filling in the parts in between. It’s a film about two kids who go to meet and stay with their grandparents for the very first time, and all the craziness that ensues. We’re talking about horror movie kind of craziness (as opposed to comedy.) some of the ideas work, but there are far too many missteps, including some gross out moments that go way too far. 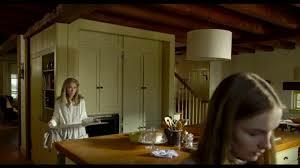 The Visit is the new horror movie by M. Night Shamalan. It’s not a very good movie, but it’s a whole lot better than anything Shamalan has directed in close to twenty years. After The Village, his career just plummeted. From The Lady In The Water to The Last Airbrnder to After Earth, it’s been all downhill. At least with The Visit, there is some connection to the kind of director Shamalan once was. The movie is filmed entirely with handheld cameras as two kids decide to make a documentary and videotape the whole experience of meeting their grandparents for the very first time. Only they aren’t just meeting the grandparents. They are spending the entire week with them. Everything about this premise feels peculiar. The mom isn’t taking the kids. In fact, she isn’t even talking to the grandpsrents. They had a falling out when the mom was fifteen and she hasn’t spoken to them since. The he kids get in touch with their grandparents through social media and the grandparents invite them over. And the mom agrees. Ther’s a lot to buy into here. Like the mom wouldn’t even talk to the grandparents to go over some rules with them about her kids. Of course, all these little holes and problems only come out by the movies end, after we know the whole story. In the meantime we are just supposed to shut up and hold on for the ride. That ride starts with the mom being interviewed by the kids, on camera. She explains the situation, and how she has to finish getting them packed, and they are off to the train. The movie does give us two major reasons to believe that the mom would go along with all of this. The first is because of the falling out, where she really doesn’t want to talk to her parents or see them ever again. The second is that while the kids are away, the mom is going on an exotic vacation with her hot, young boyfriend. And then, lastly, maybe she’s just not the best mom. Maybe it’s as simple as that. On the train ride, we get to know the kids a little. The boy wraps. The girl, who is older, uses big vocabulary words and seems to know exactly what they mean. This is the exact opposite of Cop Car, where kids really were kids and had the simple minded ideas of childish fun. Here, these kids often act more like adults. In one great moment, that happens later in the movie, the boy throws a ball up in the air and then spins around in circles waiting for it to come down. He stares up at the sky, after the ball, as if he’s incredibly fascinated by it. When his sister asks what he’s doing, the boy responds, “this is how kids play.” He’s doing it to fool his grandparents, who are off in the distance watching. When the kids arrive at the train station of their grandparents, they get off the train and immediately start filming. The grandparents go along with it, and allow themselves to be filmed, but look incredibly confused. Then, once they get to the house, the grandfather gives them one simple rule. Don’t leave the bedroom after 9:30. There’s no tour of the house or Dotson talk or anything. Just that one rule. And of course the kids break it as often as they can. They apend the first day exploring and playing games around the house. When they play tag, on the grounds under the house, the grandma comes after them, crawling on all fours. It’s a crazy and surreal sight. And that night, when the kids open their bedroom door after curfew, they see their grandmother down at the bottom of the stairs, waking around and vomiting onto the floor. She just walks and vomits, walks and vomits. Very strange. The next day, the kids talk to the grandfather about this and he assures then their grandmother was just sick. Next it’s his turn to be weird with adult diapers that he defecates in and tron brings out to the shed. Pretty disgusting. And it gets worse, by the movies end. In fact, the grandpsrents continue to get more and more weird throughout the course of the film. The girl asks the grandmother about the mom, on camera, and the grandmother freaks out. And the grandpa attacks a man in the middle of the street, one day, who he thinks is watching them. This stuff is kind of cool, but the movie takes a turn for the worst after the twist is revealed and suddenly things go nuts. It’s a cool twist, but it leads to a sort of free for all (including one diaper moment even grosser than the last one.) This movie should have known better than some of the mistakes it makes towards the end. One of those mistakes is the way it sort of goes nuts and has the characters get so unwound that we aren’t even sure what’s happening at times. That just makes us stop caring. Another mistake it makes is a little more straight forward. A neighbor shows up at the house, talks to the grandpsrents, and then the kids comment on how they never saw her leave. They continue to comment about this. It’s all telling and no showing. A screenwriting rule is show don’t tell. If we saw something happen to the woman, like her go into the stack and never come out, for example, it would have had such a stronger impact. It’s mistakes like this that really hurt the movie in the end. There are lots of positives, from the creative story to the really cool twist, to tthe way that the moms backstory about what happened to her is kept from us. Still, for everything that works, there is also plenty that doesn’t. The scene of getting the girl to climb into the oven, for example, is wasted by nothing happening. And we have to watch that moment happen twice for absolutely zero payoff. its problems like that which lead to the movie falling short of its mark.